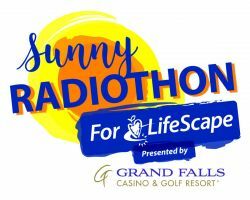 Tune in and be inspired on Sunny Radio 93.3FM or 1520AM in Sioux Falls on September 27th & 28th. Every hour you'll hear stories of children and adults with disabilities being empowered to live fulfilling lives thanks to generous donors and caring staff. For details, contact Kim Haiar at LifeScape Foundation: kimberly.haiar@LifeScapeSD.org or 605-444-9806.